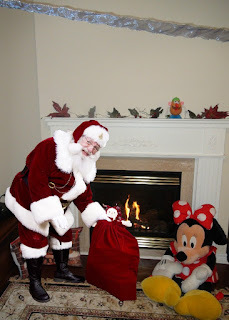 When I first saw iCaughtSanta.com, a site where a custom Santa photo can be made, my reaction was "WOW" what a great idea. Customers can upload any photo (I took my living room photo), add Santa Claus, download & print as proof that Santa was in YOUR HOME. In 3 easy steps I received a custom made photo with Santa using iCaughtSanta.com The site is easy to use in terms of scaling and rotation, it also has about 20 poses of Santa to choose (some of them really funny) to fit your photo proof. My little Teddy was very excited when he saw the photo, pointing million times at the Santa. What an amazing way to create some magic things, I only regret that I am not a kid any more.